During the 19th century there was greater interest than ever before in the sciences of anatomy and medicine. New technologies helped scientists and doctors to develop their understanding of anatomy and the internal structure of humans and animals. 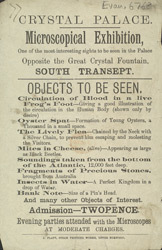 Exhibitions like this one, held at the Crystal Palace in London, were opportunities to display examples of these new technologies. At this "Microscopical Exhibition", visitors could view the circulation of blood in a frog, tiny insects living in water and, most unusually, a "Lively Flea", which was apparently "Chained by the Neck with a Silver Chain, to prevent him escaping and molesting the Visitors."